While I sympathize with a lot of what you say here (and also have my doubts about what has been done at Hanford), some of your points nevertheless fall victim to the logical fallacy of hasty generalization on insufficient facts. For example, perhaps, we should at least wait until the warm weather months before making grand pronouncements about what the volume of bike traffic is going to be on 18th Ave S. I suspect that a lot of cyclists aren’t even aware that there is now a bike route on 18th. I’m not a cyclist. I would have been fine leaving things as they were. But it still seems like this new configuration deserves a fair chance to prove itself. I have crossed the street at Hanford a few times now as a pedestrian, and it seems like the islands provide a benefit in that context. If we’re going to have more commercial activity on those blocks of Beacon Ave S (which is a good thing), we’re going to have more people on foot crossing the street there, etc. The net result will be a more vibrant neighborhood, but also probably a less efficient flow of auto traffic on Beacon Ave S. Long-term, we’re probably going to need some sort of an Island or signal up by the Valero and the Oak too, because right now it’s quite an adventure crossing the street at that point. As a driver, this will no doubt annoy me. But on balance, hopefully the trade-offs will be worth it. In my honest opinion I don’t feel the islands provide any other service than to increase the number of choke points on Beacon Hill. In reality the islands create a dangerous situation for a bike rider wanting to turn left off Beacon onto Hanford whether that be East or West. For a bike rider to negotiate the island they must move from the bike lane into main stream traffic then quickly slow down to navigate between the islands. So how does that make it safer for bikers? Adding islands to the middle of the 2 way turn lanes pushes more cars to navigate the back roads through the nieghborhood in order to get to where they want to go now. So what we have done is increased traffic on the side roads and this is where we will find most kids/young adults playing at any givin moment. These islands provide no real safe haven for pedistrians. It is like the trucks with back up beepers. It warns pedistrians that someone is backing up but for the driver it creates a sense of false security. That beeper will not prevent someone from being hit just as the islands do not prevent someone from getting hit from a car. I have never seen a curb stop a 4,000 pound car. So in a sense these islands build a false sense of security to folks crossing. Because it really is not a “safe” zone. Here is the reality of all these traffic revisions. When DOT was having an open house at Jeffereson Community Center to discuss changes to 15th Ave, Columbian Way etc with bike lanes I attended. I was early so I had the attention of all 3 street designers and I asked if they were aware of the traffic “jams” that are being created. I even asked if any of them would like to step out front to view the back up of cars at the intersection of Spokane and Beacon. They all declined which told me they already knew. Looking over the map they provided of potential changes I was able to provide good argument regarding the lose of parking to local residents or the removal of car lanes to add bike lanes and a 2 way turn lane that leands you to make left hand turns into nothing more than bushes and trees. I wasn’t angry nor upset with yelling or screaming but quite concerned so I was calm while discussing and searching for questions. However 2 of the designers finally walked away and after a few more minutes the 3rd finally said “Look, here is the truth. We are instructed to create congestion to get you out of your cars”. This is not some fairy tale I am creating but simply the truth as told by one of the street designers. Just look around you when you drive or make it a point to check out some of the areas where these changes have been made. Columbia and M.L. King gets really backed up as does 15th and by McPhersons Fruit Stand. These are due to reducing the traffic from 4 lanes down to 2 and adding bike lanes. Now the addition of bike lanes is not a bad thing but in reality those streets were so wide the bike lanes could have been added without sacraficing car lanes. And I don’t know about you but when there is an additional center lane and I see a biker I like to move to the center lane to give extra room between me and the biker. Now I am forced to drive right up the side of a biker. A lot of the projects is nothing more than the mayor trying to leave a legacy by putting Seattle on top with having the most milage of bike lanes. But in the process he will leave a legacy of a city with some of the worst traffic woes in the nation. They way it is being done is what is dividing a lot of car drivers with bikers. Or you could just park your car, get out, and walk across the street. The situation will only get worse when they add the island at S. Spokane and Lafayette Ave, which will narrow a portion of the already incredibly congested S. Spokane to one lane. I don’t doubt DoT engineers are attempting to create congestion — in fact, the last two or three years have proven them to be wildly effective at this on North Beacon Hill — but they don’t seem to understand that this DOES NOT get people out of their cars, just as HOV lanes don’t get people to carpool. All they’re accomplishing is diverting cars driven by frustrated, angry drivers to residential streets, making those streets far more dangerous. as a bicyclist that regularly uses the 18th ave S greenway, the hanford crossing does work. i actually *love* it. installing these islands not only created a much safer passage across the beacon ave S “expressway”, but makes our neighborhood more walkable and bike-able. reading the replies, i understand that change is hard, but screaming about it mere weeks after its installation is only alarmist. give it time. (and if you’re a bicyclist wanting to turn left off of hanford? might i suggest using another street north or south of it… for the greater good of getting kids riding to school, octogenarians on their way to red apple, so as to get safely across beacon ave S, sometimes you have to make small changes. it’s really not that bad. I agree with “j-lon” that the warmer weather will bring increased use of the greenway. I’ve already noticed a large increase in the number of riders I spot daily especially on 18th Ave between the Mountain to Sound Trail and Mcclellan St.
Anna, sorry but what I repeated is an exact qoute by one of the DOT designers. I gain nothing by making that up. Eric, the intersection at Hanforld and Beacon already had a cross walk signal. Please explain to me how the islands create a safe barrier that actually protects a pedistrian or biker? As for serving a safe passage to Red Apple it is too far away to consider an effective means of crossing. You already have a cross walk signal at the Beacon Library, at Beacon and McClellan in addition to marked cross walk by the Link Rail station. Those are much more effective for travel to Red Apple than Hanford. Doyln, you are right the traffic on Beacon isn’t any worse than some other areas of the city now. But at one time it was much better, until they made all these changes. As a pedestrian, I’m indifferent to the Hanford crossing because it’s new, so far it’s more work because I have to watch for confused drivers. I LOVE the stop signs and street trees along 18th. I’m very excited to walk/jog the Greenway with my kid and look forward to when she can bike along it. As a driver, it would never in a million years occur to me to drive south along 18th and turn south onto Beacon from Hanford–before or after the Greenway. There are lots of other chances to connect with Beacon on either side of Hanford. Beacon Ave is the arterial and driving along 18th to avoid the McClellan intersection should be discouraged. It’s okay to slow down in your car. It’s okay to wait for pedestrians and cyclists. Any traffic calming that happens on Beacon (and/or Spokane) will only serve to bring speeds closer to the legal limit instead of the 10 miles over people have grown to expect along that corridor. I really don’t see this as a “bike vs car” situation. It’s a “drive through vs visit” situation. The funding for the Greenways came from the Bicycle Master Plan (not one dollar could have been used for potholes, by the way), but the Greenways benefit everyone. In Beacon Hill, the Greenways possibly benefit businesses more than any other “special interest group”. Anything that slows traffic and makes it easier and safer for people to walk into a storefront business is good for that businesses. Our business district is pedestrian-oriented. The services provided are intended to attract nearby residents and those accustomed to walking a few blocks (either from a parking space or from the bus/light rail) for their meal/coffee/drink. Jefferson Park (including the Community Center) is a place to explore out of your car. It’s okay for cars to slow down–in fact, it’s great. Slowing down is safer for drivers and those they might hit. It’s not an unreasonable burden and is value-added for the neighborhood as a whole. Even if we don’t see an uptick of cyclists on 18th (and I expect we shall) I’m confident we’re less likely to see a kid hit by a car speeding across 18th to make the light at Hanford & Beacon. That’s worth a lot. What is boils down to is that the majority of the bike infrastructure up until very recently has been designed for confident and fit bike riders (imagine a downtown bike lane located between fast moving traffic and parked cars). Studies have shown that these facilities serve a small fraction of the population very well, but do not attract that many more folks who are not comfortable biking on busy streets. Cities around the world are now switching to installing cycle tracks and greenways instead of only bike lanes, and it is working. People love em. Give it some time, there will be some hiccups along the way, but in the end we are going to have a great network of quite residential streets where it is safe and efficient to get around by foot and wheel. My middle-school aged son rides the new Greenway by himself to school most days when it is not raining. He loves the new stop signs and I feel much better knowing he is now on a Greenway. There is something I don’t understand; why are there “no left turn” signs for southbound Beacon, but not for northbound? I may be dreaming, but I swear the southernmost sign was initially facing south until workers turned it around over the weekend a couple weeks ago, leaving no signage for northbound traffic that would indicate that a left turn is prohibited. Good question Chris. The answer is the business owners at Beacon and Hanford do not like the new “no left turn EXCEPT BICYCLES” sign because it prohibits their Northbound Beacon customers from accessing Hanford st. 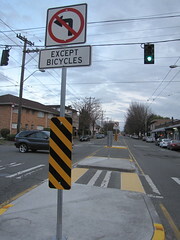 The revision is also a hazard to bicycles turning left onto Hanford from Beacon in either direction. To make matters worse. the islands now force cars closer to moving bikes, as well as drivers parking cars south of Hanford. Drivers no longer have the option of giving bikers or parking cars “3 feet of space” because SDOT put a big hunk of concrete in the road. The original plan called for a complete blockade across Beacon for drivers, with two narrow slots in the center for bicycles to cross. SDOT may still do that. I attended the last Beacon Bikes meeting, held in a private home. I was a little shocked to find the two SDOT engineers responsible for the “green way’ in the living room.. There were very few people in attendance even though the engineers were there to take feedback on the work done so far, but apparently only from Beacon Bikes. One engineer said the green way was an “experiment” and that we (Beacon Hill) are “guinea pigs”. The same engineer also said, “We are breaking the law.” I wonder if it is even legal for SDOT to arbitrarily block anyone’s access on a public street? SDOT says Speed, Average Daily Trips (ADT), and accident reports are the three data points used to engineer traffic revisions. There were zero accidents at Beacon and Hanford AND it has a signalized crosswalk with a button to tun the light red for pedestrians or bicycles. The ADT (average daily trips) on Hanford is already under 1000 which the Beacon Bikes/ALTA plan calls “”ideal” for a bicycle boulevard/green way. There was no need to attempt ADT reduction on Hanford which is the real goal of all the green way “revisions’. Melissa made a keen observation about having to look out for “confused drivers”. The question we should ask is whether anyone was confused before. Is this confusion a safety improvement or a hazard? No one had a problem figuring out this intersection before the revision. Now everyone is doing everything except what SDOT expected, which is to stop making left turns. No one is paying any attention to the signs. There are left turns,drive through across Beacon on Hanford, u-turns within the intersection, u-turns completely around the islands, bikers turning off Beacon on to Hanford from behind the islands, moving diagonally against the flow of traffic in the opposite lane; a very dangerous maneuver, and a leading cause of cyclist death. Sadly this dangerous action still feels safer than turning at the intersection. There is far too much confusion for any one to “get used to it”. Besides, there are 13,000 to 15,000 ADT on Beacon ave. It is not always the same 15,000 drivers. This “green way” revision is so strange and unusual no one knows what to make of it. If SDOT has to put up a bunch of signs with instructions (that nobody pays attention to) on their revision then it is the traffic engineering that has failed, not the users. Sink these islands before someone gets hurt. The sounds of screeching tires, honking and cursing now coming from the Beacon/Hanford intersection is not the sound of people getting used to it. Those are the sounds of an experiment going terribly wrong. 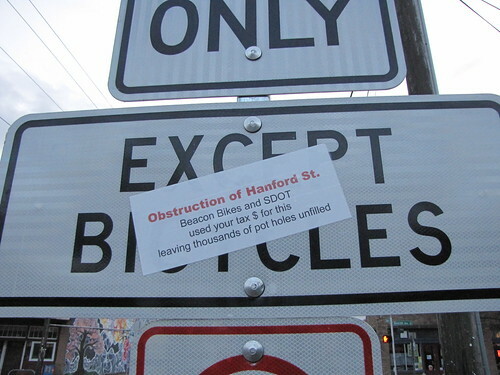 Who asked SDOT to make us their guinea pigs anyway? Over here in Genesee we have the same experience with SDOT. Their marching orders do not include common sense. They have not pushed people out of cars but merely pushed them to side streets where speeds have increased. 38th/Cascadia is a great example of really poor engineering. Adding a bike lane has made things more dangerous for bikers and increased speeds on the street. All of which is close to an elementary school. Gearhead hysteria. If people are driving fast on residential streets, that’s the driver’s fault. If you’re too stupid or selfish to go an exta frickin’ block before turning, or to slow down if you are uncertain how to proceed, you should be handing in your keys. All this is is a restricted intersection with a traffic island. Get over it. I’m not a cyclist. I’m a fat old guy who drives everywhere, but I have the common sense to share the road. Mark Holland I find it appealing that SDOT is so accommodating to meet with Beacon Bikes but not an open meeting with Beacon Neighbor which would obviously include automobile drivers. I find the information you have provided quite interesting and upsetting, not at you but at the fact we seem to be heading in the wrong direction i.e. from 12th in the nation to 4th worse congestion and that is a large part thanks to Mayor McShwinn. And he is doing it in record time. Thank you for the great information Mark. I want to know if anyone has taken the time to watch the crossings at Hanford and Beacon. I now observe a lot more people jay walking across the street instead of waiting for the light. The problem is they now see these islands as a safe haven and it is only one lane of traffic to cross to get to safety. Hence my comments about a false sense of security. Anna, I mis-read your response and yes they are creating congestion. I want to know how we can fix all the streets they keep screwing up! that “right only” is annoying. Its a lot of money for what seems like a flop. I think the people who did that had their heart in the right place. what freeks me out is the bad mix of 40 MPH trafic on N. 15th and a bike lane and parking. 35mph signs are not practical right there. what are you going to save your self? getting to a trafic jam at jackson and 15th 10 seconds early?